Greek Yogurt is thick creamy curd simple to make at home. The numerous uses of Greek Yogurt range from a spread to a dip, in baking to make smoothies. 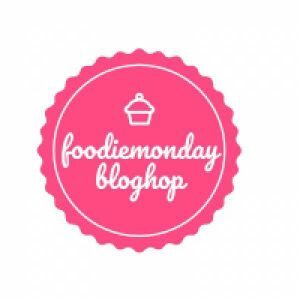 This week in #181 FoodieMondayBlogHop Sujata of Pepper on Pizza had suggested 3 options and Levantine Cuisine won the polls with an overwhelming lead. Sujata’s place is teaming with such delicious salads, and latest one that I am drooling over is this kadhi with drumstick leaves. Wish she lived next door then I do not do anything just get the food from next door. Since she will be here Wednesday I choose the simplest of the dishes, Greek Yogurt, the very basic and will build on it depending on what she wants. 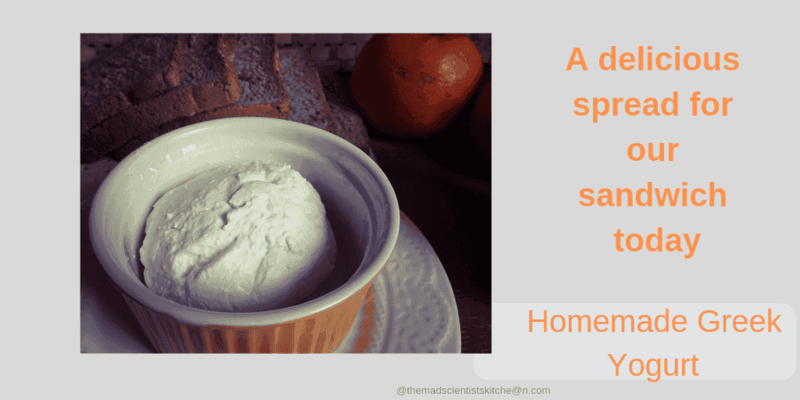 Greek yogurt you can buy in the stores but it is simple to make at home. Greek yogurt is a dairy product where the whey is strained from the yogurt or curd. The straining drains out the excess water and lactose too but the extra minerals are also leached out. Hence use the leftover liquid the whey can be used to make smoothies or knead your chapatti dough with it. To make Greek yogurt you can start with readymade yogurt but I prefer to make my own curds or yogurt. 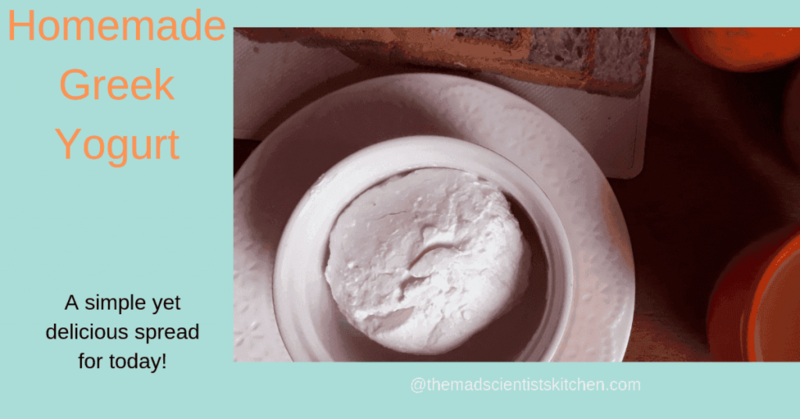 For most Indians making curds or yogurt is common place everyday occurrence but some like my friend Mabel who find it difficult to make curds here is how you make it. Psst this is the same think we use to make Shrikhand and we call it Chakka the only difference is we do not strain the curds in the refrigerator. Heat the milk until the milk comes up. Set aside until the milk cools to lukewarm. In a sufficiently big bowl add the curd and spread it to the sides. Crush all the lumps. Pour the warm milk into the bowl put a lid and set aside in a warm corner undisturbed. In my place where the temperatures hover around 26⁰C-31⁰C the curd will set fine but where it is cold you may have to cover it with a kitchen napkin. In Delhi, my mother used an old woollen cap to cover the bowl. The milk will set and form a thick curd in 8 hours. Refrigerate until cold for about 2 hours so that the yoghurt thickens. In a fine sieve layer with cheesecloth in the form of a T and place over a bowl big enough to hold the sieve. Spoon the cooled curds on to the cheesecloth, cover and refrigerate for 8 to 24 hours, depending on how thick you want your Greek Yogurt. I make this often, but not in the refrigerator. I hang yogurt in a cloth over the sink for 2-3 hours, and let all the water drain out. Then, I use it to make dips, sandwich spreads, shrikhand, etc. A great, detailed recipe which I’m sure will be of help to many. Like you, even I prefer making my curds, chakka and paneer at home di . This plain Greek yoghurt looks just perfect. Would add some fresh strawberry puree to it and enjoy as a dessert. Now strawberries and greek yogurt sound yummy. Will make. We need Greek yogurt so often. Loved the well explained recipe. 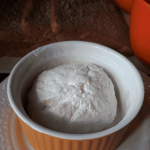 I make hung curd to use in my recipes. This looks so perfect. Lovely share. Loved your simple recipe for the greek yogurt made from scratch. Perfect for making dips and desserts or I will love to have it just like that with some toasted pita chips or bread. Love the detailed recipe for making plain Greek yoghurt at home. This Greek yogurt is so versatile. Fab share. The Greek Yogurt looks so much better than store bought. I am sure the recipe will help many who plan to make this at home and often think that this may be a lengthy procedure. They will certainly be happy with the outcome. Awesome share. 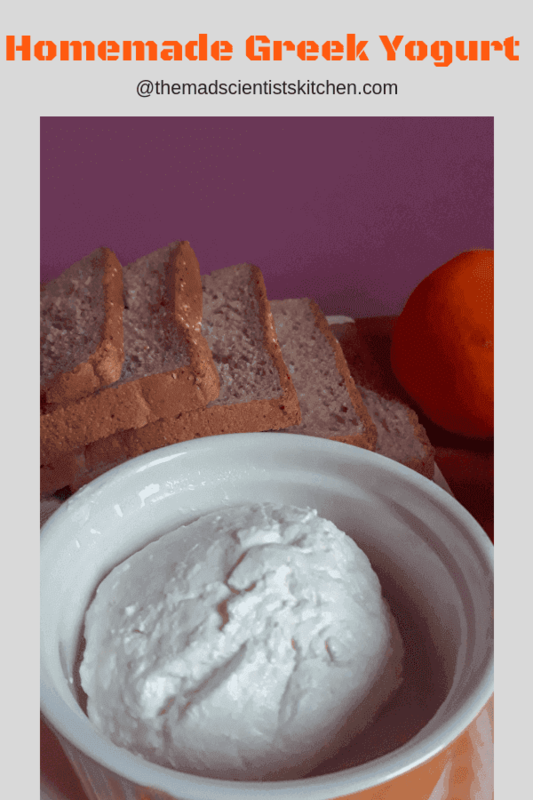 Surprisingly I did not realise till I read your recipe, that Greek Yogurt and labneh are the same! I guess I never thought about it. I make salad dressings with labneh and your clear instructions will make it easier for me the next time I make it. Love this post. I was quite tired of telling people, greek style yogurt is not greek yogurt, Now i can simply send this one and I use the same to make Shrikhand too..
Have you made images yourself? How did you made it very nice images. Thanks, they are images clicked by me.